The weather has been oscillating back and forth recently and some inland areas even reported frost earlier this week. There was a Striped Bass spawn on the Choptank last Friday when the sun shown brightly and temperatures soared; so hopefully this event also took place on other spawning rivers and there will be a new infusion of post-spawn Striped Bass into the bay fishery this week. The forecast for the rest of this week and next week has air temperatures in the 70’s and 80’s so water temperatures in the freshwater, bay and ocean areas should begin to rise substantially. Fishermen looking for some catch and release Hickory Shad action were treated to yet another good run of fish last week when warm temperatures on Friday and Saturday pushed fish that were holding in the river to make a run up Deer Creek. Fisheries biologists working in the area collecting brood stock don’t put much hope in the fishery lasting much longer since we are into the middle of May. 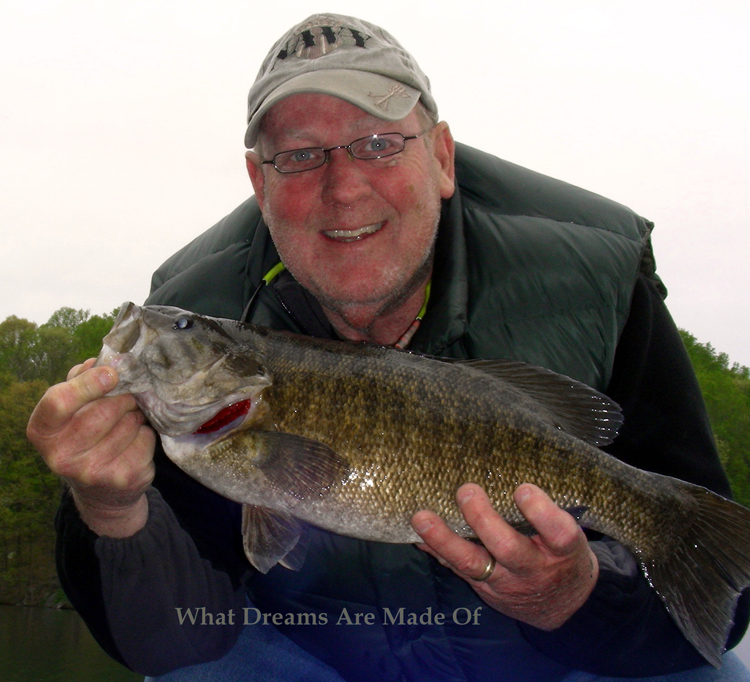 Recently the focus of fishermen in the lower Susquehanna has been the excellent White Perch fishing that fishermen are enjoying by casting shad darts, small jigs and spoons from shore and boats. A few American Shad and Hickory Shad are still being caught as well as a few striped bass in the river. Fishing for Channel Catfish in the Susquehanna and Elk Rivers has also been excellent. Out on the flats area fishermen are finding White Perch in some of the channels such as near Turkey Point and Spesutie Island; the perch are spreading out and are beginning to take up residence in their normal summer haunts. Striped Bass fishermen will see some of the lower areas in select tidal rivers open up to fishing tomorrow, May 16th and will be allowed to keep one fish above 28″ and add one fish below 28″ to their daily creel limit. This will certainly be a welcomed addition for fishermen and smaller lures will now be part of the trolling spread of most boats. Water temperatures in the bay have actually dropped slightly due to some recent chilly nighttime temperatures and are still holding around 60-degrees but warmer weather is arriving and the upward climb of water temperatures will once again continue. Most of the traditional steep channel edges above the Bay Bridge continue to produce fish this week for boats trolling and others who are chumming or chunking at Love Point and Podickory Point as well as the Bay Bridge piers. Jigging will become more popular after tomorrow also now that one Striped Bass less than 28″ per day will be fair game. John Fuss was fishing north of the Bay Bridge on a charter when he landed this nice fish. There have been good reports of Striped Bass less than 28″ being found out in front of Hooper’s Island and the mouth of the Honga River as well as the lower Potomac this week. There have also been continuing reports of croakers being caught at the mouth of the Honga River, and at the mouths of the major tidal rivers on the lower eastern shore, the Point Lookout area and near Bushwood on the lower Potomac. Some impressive catches of large Speckled Trout are being reported in the Tangier/ Pocomoke Sound area by fishermen drifting bait in channel areas and casting Gulp Mullet swimbaits in shallower areas… White Perch are moving into their summer season areas and offer good fishing for those using bait or casting jigs and spinners near structure. Recreational crabbing continues to be slow in the middle and lower bay regions with only a season’s first taste of crabs for those willing to put in the time. Freshwater fishermen at Deep Creek Lake are enjoying good fishing for a variety of fish this week as Largemouth Bass begin to move into shallower areas in preparation for spawning. Largemouth Bass are taking up residence near and under floating docks and grass beds in the shallower coves. 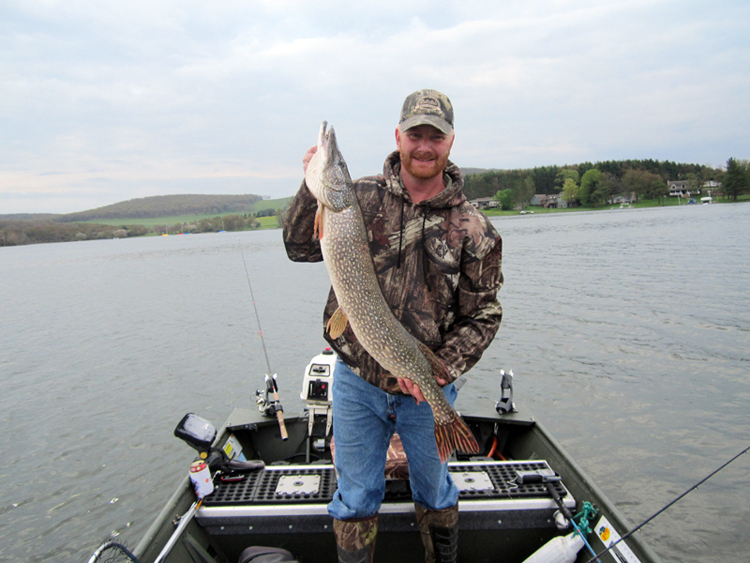 Smallmouth Bass are being found near rocky points and Northern Pike such as the one being held by Eric Richter before being released are being caught. Trout fishing continues to be good in most trout management waters as trout stocking crews continue to stock trout this week in many of the put and take areas. Be sure to check the trout stocking schedule for updates as they occur and get out and enjoy the weather and some fun trout fishing opportunities. John Mullican reports that the 3″ of rain the area received recently has the upper Potomac at flood stage and too dangerous for fishing. Largemouth Bass in most regions of the state east of Allegany County are either still actively spawning or are off their spawning beds and providing some fun catch and release action as they feed aggressively. Water temperatures are still cool enough that good fishing prevails throughout the day. Fishermen have been having fun casting chatterbaits and poppers into shallow cover and also using spinnerbaits, soft plastics and shallow running crankbaits near grass, spatterdock fields and sunken wood such as fallen tree tops. Tidal rivers such as the Pocomoke on the lower eastern shore, the Susquehanna Flats and nearby tidal rivers as well the tidal Potomac and the multitude of farm ponds and lakes spread across the Maryland landscape all provide Largemouth Bass fishing opportunities. 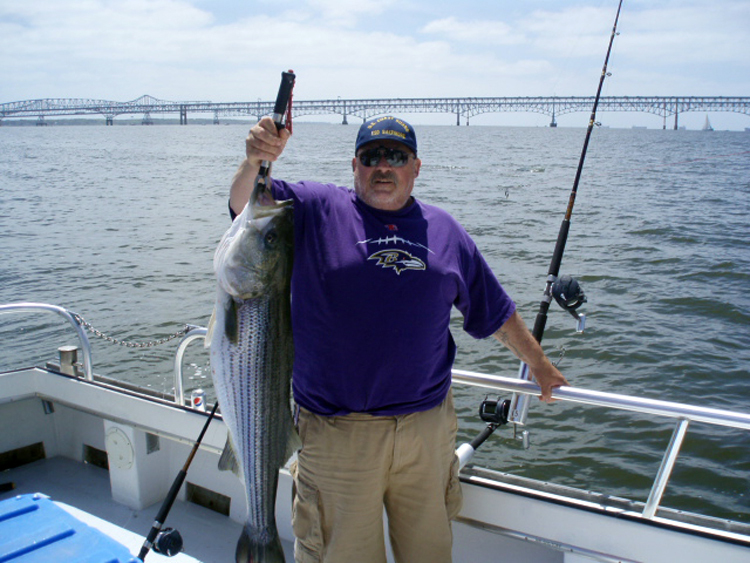 The Baltimore County Reservoirs are a favorite for many fishermen because of the high quality fishing there and their close proximity to population centers. Two reservoirs in particular, Liberty and Prettyboy also hold amazing populations of Smallmouth Bass as evidenced by this beauty that Bryan Wilhelm caught and released at Liberty recently. Ocean City area surf fishermen are jumping out of their waders this week with excitement as the vanguard of the spring north bound Striped Bass migration began to show up at local beaches. Fishermen are still dealing with the beach structure changes that Sandy left in her wake in some areas, but many are reporting being able to wade across the trough to get to the outer bar this week. Large cut baits of Menhaden and clams have been the favorite choices for fishermen and most know to bring plenty of bait because of skates and spiny dogfish that are eager to chew up baits. Fishermen using smaller baits of Fishbites, cut bait or bloodworms have been catching a lot of blowfish and a few kingfish and small bluefish. Inside the inlet tautog are being caught on frozen sand fleas and pieces of green crab near the jetties, bulkheads and the Route 50 Bridge. Casting large swim shad and jigs at night has been producing some nice large Striped Bass for fishermen this week. Good flounder fishing is being found in the channels leading to the inlet and the back bay areas. Gulp baits with squid or minnow combinations have been a favorite to help weed out the large number of throwback sized flounder. The Tautog daily creel limit drops to 2 fish per day at 16″ on May 16th.